ISS astronauts performed a spacewalk. On April 08, 2019, American astronaut Anne McClain and Canadian astronaut David Saint-Jacques performed a spacewalk to continue the ongoing program to replace the station’s aging batteries and upgrade power systems. The main task was to establish a redundant path of power to the Canadian-built robotic arm, known as “Canadarm-2”. The EVA (extravehicular activity) lasted 6 hours and 15 minutes. This was the first spacewalk for David Saint-Jacques and the 2nd for Anne McClain. Russian rocket launched from Kourou Cosmodrome. On April 04, 2019 at 17:03 UTC the Russian "Soyuz-ST-B” rocket-carrier was launched from Kourou launch site in French Guiana. The rocket equipped with the "Fregat-MT” booster orbited 4 satellites. The Russian-built Soyuz rocket orbited O3b telecommunication satellites. The satellites are owned and operated by O3b Networks, which is a wholly owned subsidiary of SES S.A., one of the world’s leading satellite operators based in Luxembourg. Russian “Progress MS-11” spacecraft docked to Space Station. On April 4, 2019 at 14:22 UTC the Russian “Progress MS-11” unmanned supply spacecraft docked to the International Space Station in about 3 hours and 20 minutes after blastoff from Baykonur Cosmodrome. The spacecraft was docked to the Russian “Pirs” (SO-1) module. The spacecraft delivered about 2500 kilograms of cargo for the ISS crew. The Progress spacecraft completed fastest-ever trip to the International Space Station. The previous fastest-ever trip to the ISS was performed by the Russian “Progress MS-09” unmanned supply spacecraft on 10 July 2018. Russia launched “Progress MS-11” spacecraft to Space Station. On April 4, 2019 at 11:01 UTC the “Progress MS-11” unmanned supply spacecraft was launched from Baykonur Cosmodrome to the International Space Station. The spacecraft was orbited by the “Soyuz-2.1a” rocket-carrier. On April 1, 2019 at 04:00 UTC, the PSLV-C45 rocket-carrier was launched from Satish Dhawan (Sriharikota) spaceport, 80 km from Chennai, India. The rocket (PSLV - Polar Satellite Launch Vehicle) orbited 29 satellites. The main payload was the Indian “EMISat” military electronic surveillance satellite. China launched tracking and data relay satellite. On March 31, 2019 at 15:51 UTC the "Chang Zheng-3B/G2” (Long March-3B/G2) rocket-carrier was launched from the Xichang Satellite Launch Center in Xichang, southwest China's Sichuan Province. The rocket orbited the “Tianlian-2” tracking and data relay satellite. 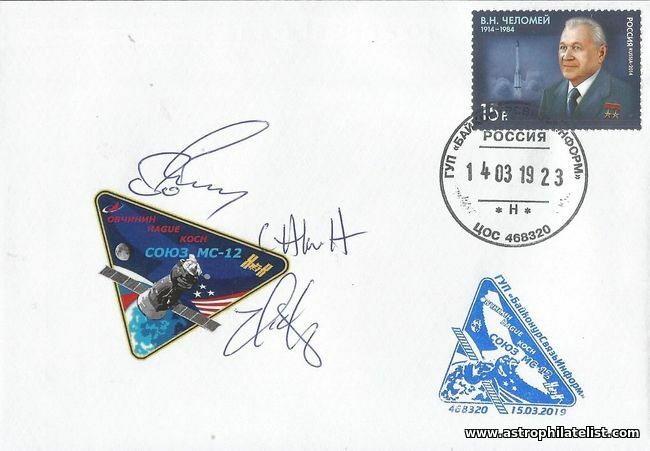 The cover was autographed by the “Soyuz MS-12” crew: Commander, Russian cosmonaut Aleksey Ovchinin; American astronauts Tyler «Nick» Hague and Christina Koch. US astronauts performed a spacewalk. On March 29, 2019, American astronauts Christina Koch and Nick Hague performed a spacewalk to help fix a solar array battery problem and to connect a second set of replacement batteries as originally planned. The EVA (extravehicular activity) lasted 6 hours and 45 minutes. This was the first spacewalk for Christina Koch and the 2nd for Nick Hague. Christina Koch became the 14th women to walk in space. Rocket Lab orbited US military satellite. On March 28, 2019 at 22:37 UTC, the “Electron-KS” rocket-carrier was launched from Rocket Lab Launch Complex 1, a commercial spaceport located close to Ahuriri Point at the southern tip of Mahia Peninsula, on the east coast of New Zealand's North Island. It is owned and operated by private spaceflight company Rocket Lab. The rocket orbited the Radio Frequency Risk Reduction Deployment Demonstration satellite for the Defense Advanced Research Projects Agency, the United States government’s military technology development agency. Soviet veteran-cosmonaut Valeriy Bykovskiy passed away. Valeriy Bykovskiy, number 5 Soviet cosmonaut, passed away on 27 March 2019 at the age of 84. Valery Bykovsky was one of the first men to enter cosmonaut training in the Soviet Union. He had performed three space flights and set a world solo flight record which remains unbeaten.